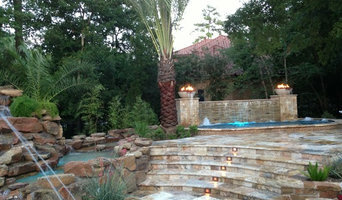 Platinum Pools has been building the best custom pools in Texas since 1998. We build beautiful pools that are designed to last a lifetime. That is why we offer a lifetime structural warranty that is fully transferable if you decide to sell your home. We believe in creating the highest quality pools available at an affordable price. We work hard on each project we complete and we pride ourselves on the top flight reputation we have created with the help of our thousands of happy Platinum Pools customers. Platinum Pools is consistently ranked as the top custom pool builder in Houston. For 2016 we ranked #1 in Houston & #9 in North America by Pool & Spa News. We also won the USA Construction Excellence Award from BUILD Magazine. We expect nothing less in 2017 and beyond, since we believe that constant improvement is the only way to run a business. No matter what pool design you may want, our experienced team of pool professionals will work with you to create the pool of your dreams. Don't know what you want? Give us a call and we can show you examples of all the stunning pools we have created since 1998 and work with you to find the best option for your yard, personality and budget. We might even bring up some options you never even considered. 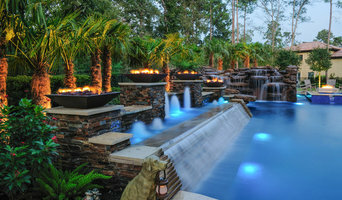 Welcome to Mitchell Custom Pools, the premier pool designer and contractor in the Lake Conroe and surrounding areas. Here at Mitchell Custom Pools we have over 30 years combined experience specializing in the creation of high quality custom pools, spas, rock formations, custom water features, waterfalls, outdoor kitchens, and much more. We believe in using the finest quality materials, and building life-long relationships with the people we do business with. In fact, over 75% of our clients are either repeat customers or client referrals. Whether it’s a service call, pool remodel, or new pool construction, you can count on Mitchell Custom Pools to be there for all your pool needs. 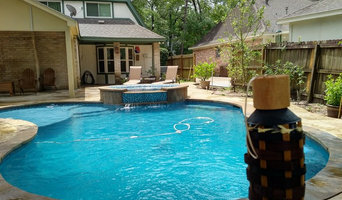 We take pride in building quality swimming pools for home owners in and around Huntsville, TX. Not only new swimming pool construction, but also professional solutions for pool remodeling and restoration services! Our network of qualified pool professionals understand what is necessary for the proper engineering of your swimming pool project; whether you have considered a freeform or geometric, large or small pool design, and even if is on flat ground or on the side of a hill. As a professional swimming pool resource service, we offer a wide range of features to ensure your end product is not only high quality, but unique and retains a high resale value. Cool Pool features like slides, Tanning shelves, grottos, waterfalls, lazy-river, LED Water Features and beach-entries can be incorporated in the design of your in-ground pool to make it amazing. Your Pool Builder is an experienced swimming pool construction and remodeling expert in Huntsville TX. Combining expertise in swimming pool development, production, design and engineering we marry artistry, vast aquatic knowledge and modern engineering methods to create bespoke custom pools and water features. We have been providing the Houston area with custom built gunite swimming pools since 1978. We also have a retail store located in Humble, TX for all of your backyard needs. WE didn't invent the pool, but every day we strive to innovate and elevate outdoor living. Water's Edge stands apart from traditional pool builders in our comprehensive, and emotionally-driven approach to outdoor environments. Your lifestyle, entertainment goals and interior home aesthetic are all carefully considered when we initiate the design process. Our award-winning team has over 55 years of collective experience in landscape architecture, pool construction, pool service and outdoor design. We are the experts in making your outdoor dream a reality. Our goal is to ensure you can count on your Livingston, TX pool contractor. Combined expertise in swimming pool design, production, manufacturing and engineering our pool contractors marry artistry, vast architectural knowledge and modern engineering methods to create amazing custom pools and water features. Our pools are never duplicated – each is created with meticulous care and attention to detail for the discriminating clientele. There is a lot more to the process than the construction of the pool. It’s a client relationship and our services exist to ensure the overall success in your pool construction project. We take great pride in not only listening to your current needs and wishes, but also in adapting those desires into a serviceable and functional swimming pool environment. Blue Crystal Pool Service offers their customers one premier weekly pool cleaning service plan. Before we start any work, we will provide an up-front pricing. We take pride in their work, being on-time, and providing quick and efficient services. Our premier service plan offers an extensive 25 point pool maintenance. This includes cleaning, minerals, chemicals, netting, and vacuuming. Montgomery County Texas Custom Pool Builders. We design custom pools with our 3D AutoCad engineering software to bring our customers ideas to life! We also Pool Service, Repair and Parts. The Woodlands Pool Service has been in business since 1998. Professional Pool Cleaning Service & Pool Repair at a price you can afford. No Hassles, No Worries. We make it easy. 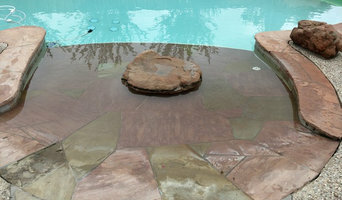 We are the best pool organization in all The Woodlands areas for a long time running. So don’t waste your time give us a call and visit our website for more information.